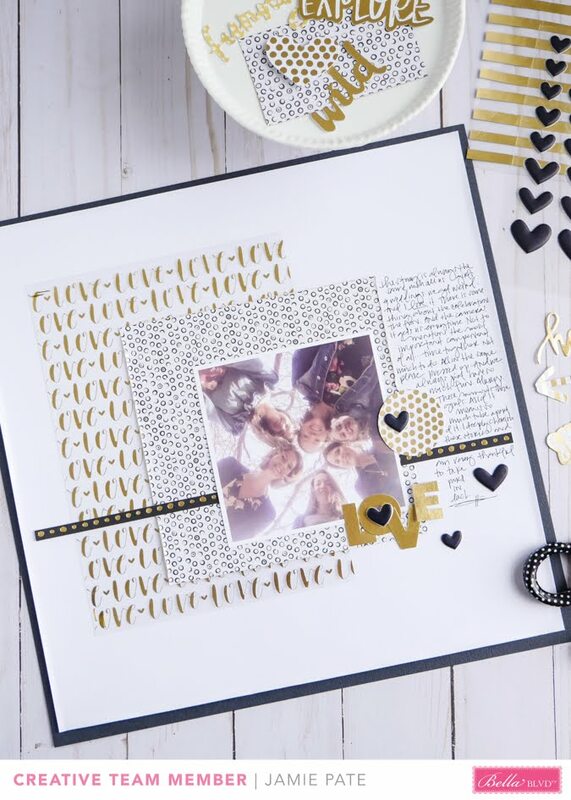 Make your mark on a scrapbook page with gold foil glam. 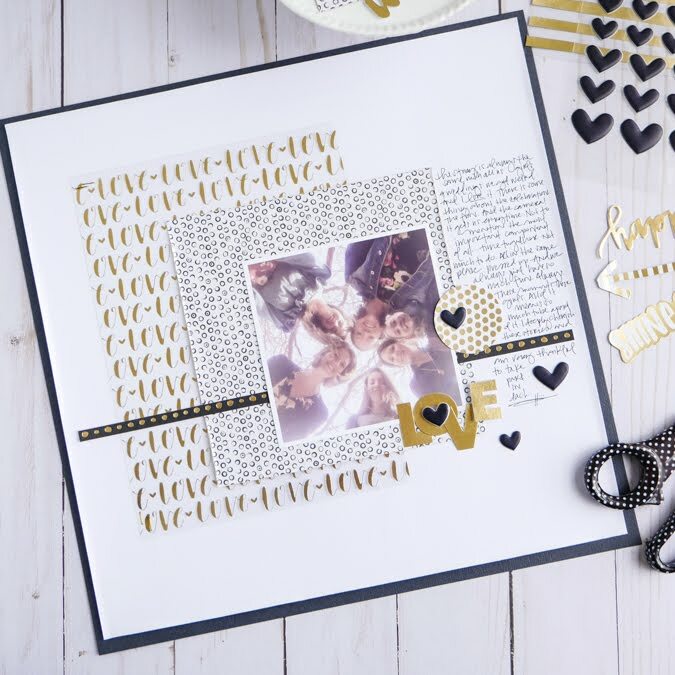 Gold foil is one of those statements that continues to stay on trend. It's glamorous. It's whimsical. And it gives great attention to a real story. This week on the Bella Blvd blog the team is taking to gold foiling this that and the other thing. I decided to stay traditional and add those gold touches to this page and this story. Today I will highlight a few of those ways I put Bella Blvd's Make Your Mark Collection to work, and play, on this scrapbook page. To start, I decided to keep the page clean and monochromatic. The white cardstock is matted with black cardstock. I like to frame these pages like this. And I think keeping the background basic lends to allowing those gold touches to shine. Make Your Mark's Paper Pieces are perfect and obvious additions to this page. 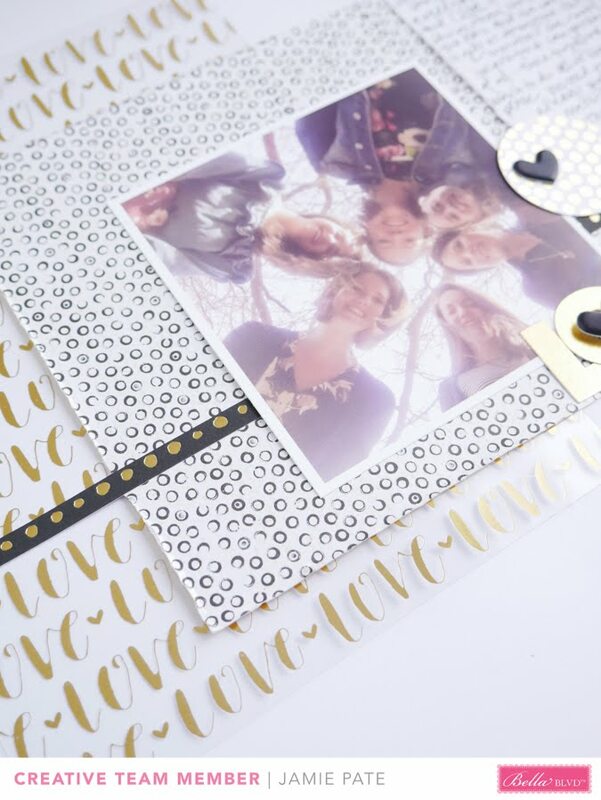 The pack is a mix of gold foil with white and then some colored pieces. Today I used only the gold and white pieces on my page. The Fundamentals Stickers from the collection includes a full set of gold foil letters. I really like how basic and clean this font is from this set. The sans serif makes for a great statement. I used these letters to highlight how much I just love this photo and these girls in it. The letters could be used to make a bold statement with a much longer title, or a bullet statement, as I did here. Make Your Mark also includes a gift tag set. 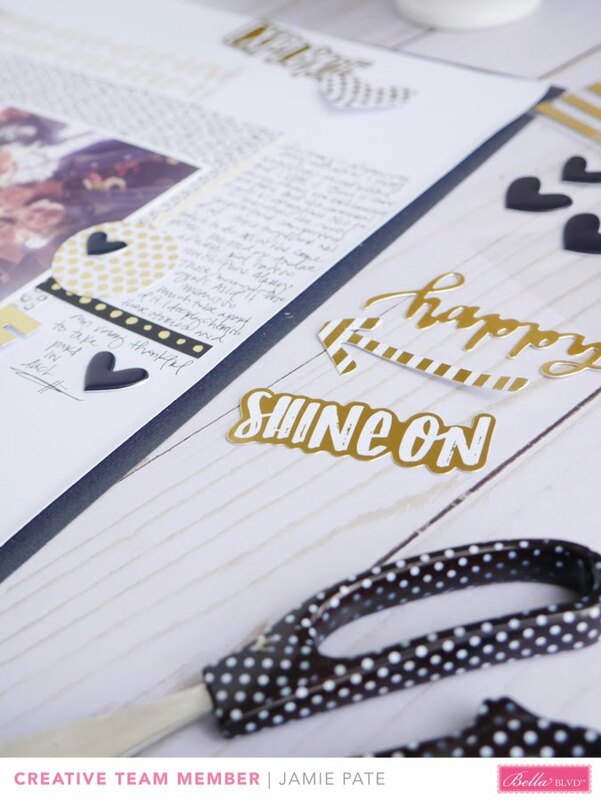 The round tag with the gold foil polka dot is from the gift tag pack. I covered the die cut circle (the one for the hang tag) with a Puffy Heart. I wanted to add a bit more shape to my page against all the angular corners. The circle tag made for a nice fit. Part of the collection also includes a pad of clear elements called Clear Cut Pad. 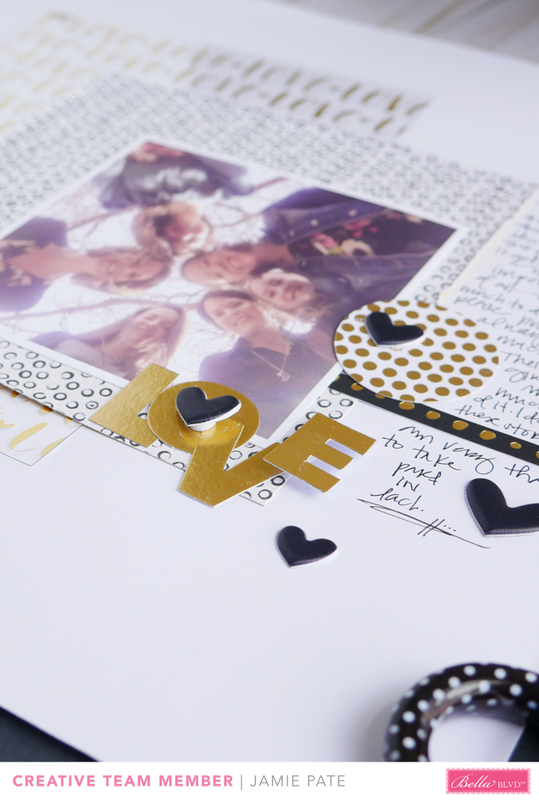 The love embellishment seen on my page is a 6x8 clear acetate sheet with foil accents. The clear transparencies look great on this page, but I've a mind to frame a few of them as well. All these elements are layered on the pattern paper called Real Deal. And how perfect is that. 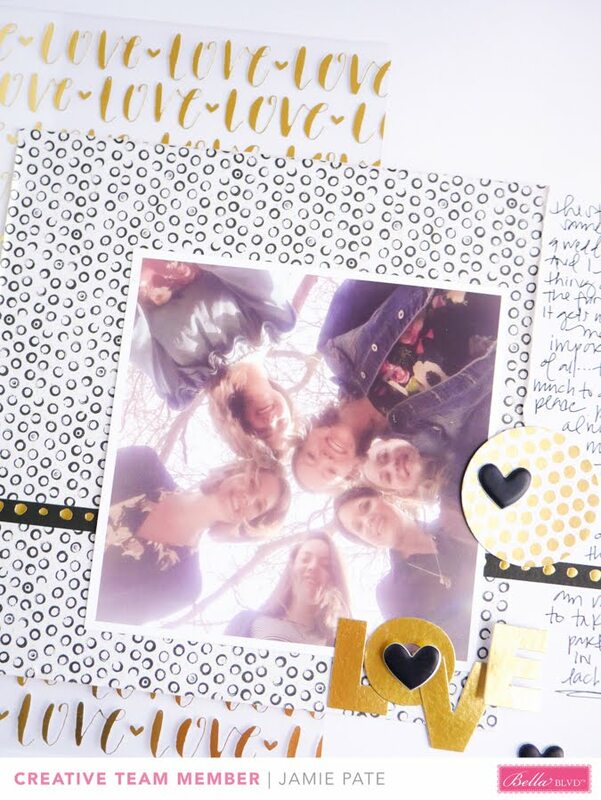 Because these women in my life, and the story journaled on this page, is just that. The Real Deal. 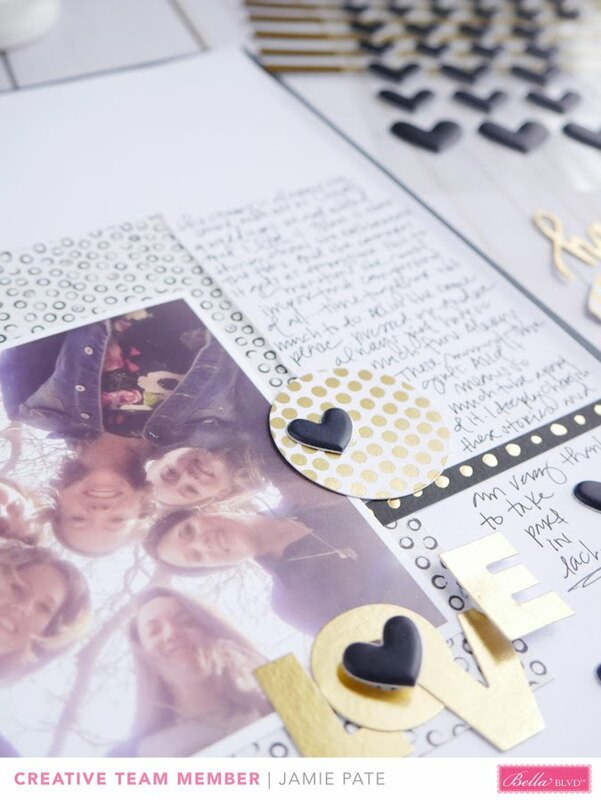 A few ideas for placing gold foil accents on your page. A collaboration of Make Your Mark found all on one spread. And a real story told and documented for years to come. At the risk of a cliche, I think that's a great way to Make Your Mark. supplies | Bella Blvd Make Your Mark: Real Deal. Clear Cut Pad. Fundamentals Stickers. Gift Tags.